← Discounted – Last Tour of the Oisans holiday of the year. What level of support do we offer on our point to point cycling tours? On a typical day on our point to point tours, our support driver will be a friendly face cheering you along and acting as photographer taking photos of the group and the amazing views along the route, all of which are shared with our guests at the end of each day. On the climbs, the support vehicle travels ahead of the group to a safe stopping point where all riders are counted by to ensure no one is left behind and that everyone has what they need, then drives ahead to wait for the group to pass again. On the descent the support vehicle usually follows the group ensuring everyone makes it safely down. 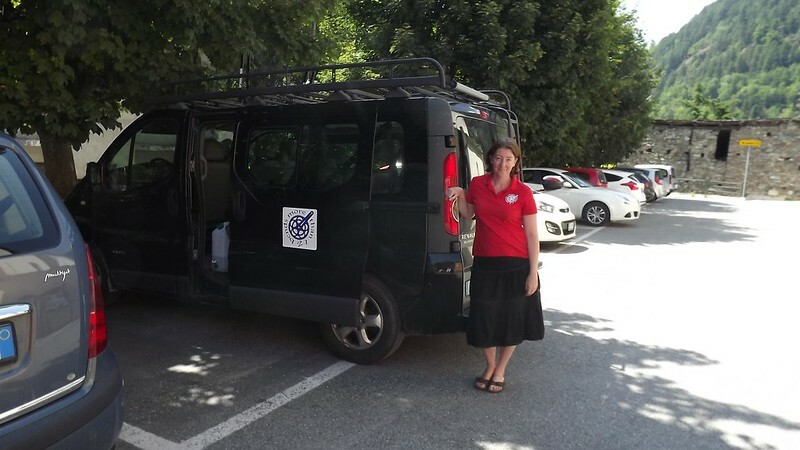 As well as carrying all guest luggage between hotels, the support vehicle carries water, spares and tools to deal with most minor mechanicals and often a few treats to share along the way, such as bananas, cakes and drinks. Our support drivers are first aid qualified and also carry a first aid kit. The support vehicle is available for riders to warm up in if the weather is cold or wet and to offer shade from the sun when it is hot, and also give a head start to slower riders and a lift to tired ones. Least favourite climb to drive : Col with No Name – it is very steep and narrow! This entry was posted in Alpe d'Huez to Italy and tagged Col de Sestriere. Bookmark the permalink.